I used to have a hard time with certain cooked vegetable salads, such as ratatouille, even though people have insisted that I would like their version. Which I’ve always found odd, because if someone told me they didn’t like chocolate (I know – horrors! ), I would not try to sell them on a brownie or chocolate cake. Ratatouille always tastes like a lot of stewed vegetable all mixed up, and never seemed to capture the distinctness of each of the ingredients like the caponata I had in Sicily, that changed my mind about cooked vegetable salads. Caponata is the cornerstone of Sicilian cuisine, according to Fabrizia Lanza, who was born in Sicily and returned to her family’s agricultural estate to teach cooking classes there. I got to visit a few years back and still remember it as one of the best weeks I’ve spent in, well…years. During the week, she made caponata, and served it on a big platter in her courtyard. From the first bite, I was hooked. I loved the way the eggplants exploded with flavor, and the other ingredients – salty olives, still-crisp celery, and capers – kept the dish bright and crunchy. It was so good that I bookmarked the recipe in her excellent cookbook, Coming Home to Sicily. The book highlights her life in Sicily, along with her favorite cheesemakers and farmers on the island, including the most incredible fresh ricotta I’ve ever had, and change-your-life tomato paste. Then a few seasons passed, and I never got around to making caponata. That changed this week, as did my stewed-vegetable life, when I took the first bite of my homemade caponata and all the flavors of the incorrigible island of Sicily came rushing back to me. Every flavor of Sicily, and summer, were concentrated in each forkful, and I couldn’t stop eating it. Here’s the kicker in this recipe. A while back, there was an article about “deal-breakers” in recipes, an ingredient or technique that make someone not want to make a recipe. Mine is deep-frying. Yes, I tackled fried chicken in duck fat, but deep-frying at home isn’t my thing. However, there I was, heating oil in my cast iron skillet and frying up the eggplant for this caponata. I got some beautiful small eggplants at the market, and watched them go from being pale, to a burnished golden-brown, and couldn’t resist snacking on the darkest cubes as soon as they were cool enough to eat. Sicilians aren’t afraid of using copious amounts of olive oil and cooks there use a lot of it in their cooking. I suspect they fry the eggplant in olive oil, too, although in her book, Fabrizia recommends vegetable oil. I used sunflower oil but you can use a good-quality peanut or canola oil for frying. Or go for it and use olive oil. A good tip I learned is to cover the surrounding stove area, including the stove and oven knobs, with aluminum foil, to lessen clean up. But in fact, the recipe gave me the chance to give my stovetop a long-overdue cleaning. And frying the eggplant in the oil ended up not being nearly as messy as deep-frying and the clean-up took just minutes. One could make fresh tomato sauce but often good-quality tomato sauce that you buy is richer in flavor than fresh, because they’re sometimes produced in regions with better tomatoes than one can buy at their local market. (That’s why canned coconut milk is often better than what you can make at home.) So I picked up a couple of jars of salsa pronta, Italian tomato sauce, and used that. I was recently at a dinner party with some Italians who told me no one in Italy uses jarred sauce, so I wondered who bought all those jars I’ve seen in Italian grocery stores? 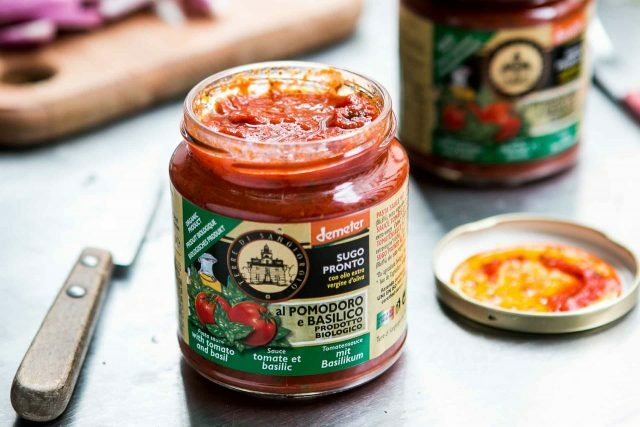 When I brought up the question online the next day, many said it was tourists, but I doubt the jarred tomato sauce industry in Italy is supported by visitors stocking up on jars of tomato sauce at Italian supermarkets. If you’re fortunate to get good tomatoes where you are and want to make your own tomato sauce, I’ve linked to Fabrizia’s salsa pronta recipe at the end of the post. If going the store-bought route, choose a good-quality tomato sauce, one without a lot of extraneous ingredients. One addition to caponata that I’ve seen are raisins, which are used in Sicilian savory cooking. If you want to add them, they could be added in step 4, along with the celery and other ingredients. 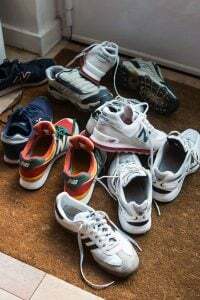 Some also add toasted pine nuts along with the raisins, which are an option, although the good ones have gotten so expensive that they’ve become a luxury. The surprising thing about caponata is that it definitely improves the day after it’s made. And I speak from experience because when I first tasted it, I thought, “This doesn’t quite taste like the caponata I had in Sicily.” Then I put it in the refrigerator to serve the next day. When I took a bite before serving it, it had magically transformed into the most wonderful eggplant salad I could imagine. Adapted from Coming Home to Sicily by Fabrizia LanzaAs mentioned above in the post, I wouldn’t be surprised if Sicilian cooks fried the eggplant in olive oil because it’s so copious there. 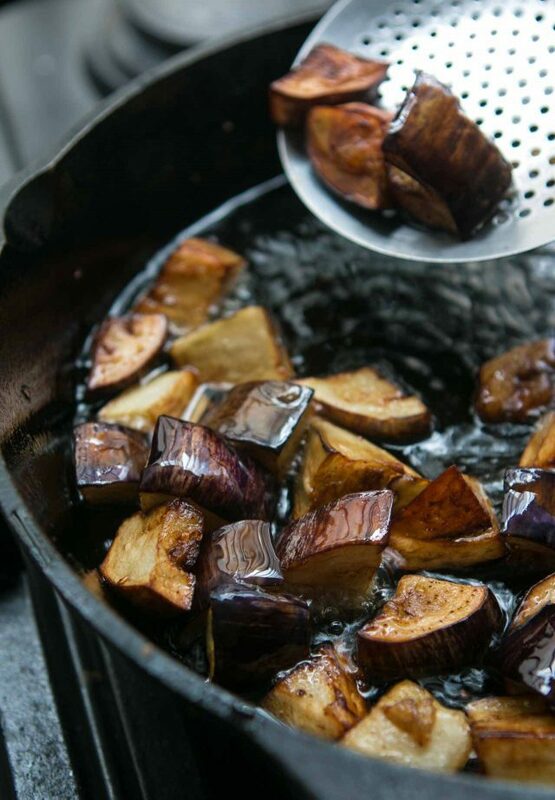 So you could replace the vegetable oil with olive oil, although not necessarily a fancy one; save the good stuff for drizzling over salads.Some might ask about salting the eggplant, which I don’t usually do because I buy smaller eggplants and never had a problem with bitterness. Some in the food world think that salting eggplant isn’t done anymore because eggplants are no longer bitter.Caponata is meant to be a touch sweet, a tad vinegary. I added more than Fabrizia but since vinegars can vary in strength, you can taste and add more later in the game. The original recipe made quite a bit of caponata and and I reduced the recipe by half. (Some might say you can never have enough caponata, but because of the concentrated flavors, a little goes a long way.) It keeps very well in the refrigerator, so if you wish you can double the recipe. 1. 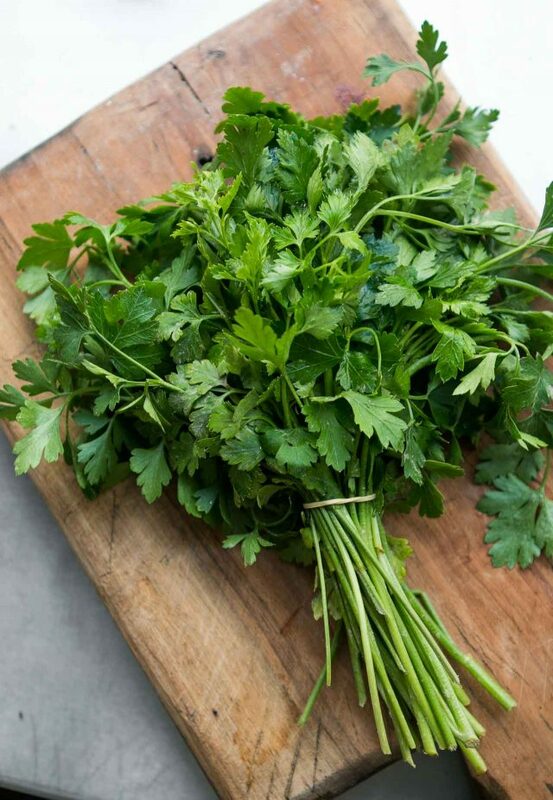 Remove the leaves from the celery branches and cut the branches into 1/2-inch (1,25cm) thick slices. 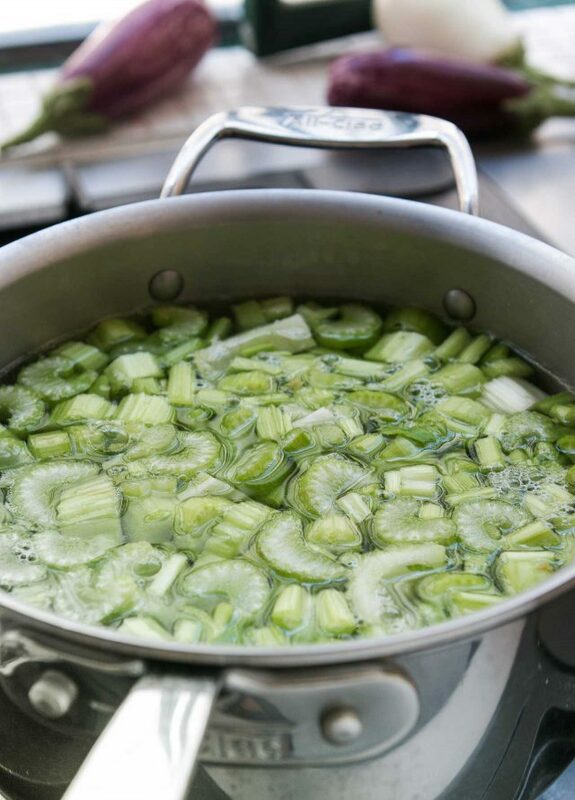 Bring a medium sized pot of water to a low boil and simmer the celery until crisp-tender, about 5 to 7 minutes. Drain and rinse well in cold water. Set aside. 2. Trim the stems off eggplant and cut into 1-inch (3cm) pieces. 4. In a large skillet or Dutch oven, heat the olive oil. Add the onion and cook, stirring frequently until wilted and starting to turn golden brown, 5 to 7 minutes. Add the parboiled celery, olives, capers, tomato sauce, vinegar, honey, and red pepper flakes. Let come to a low boil then add the eggplant. 5. Cook the mixture at a simmer, stirring carefully so as not to mash up the eggplant pieces, for 3 to 4 minutes. Taste, and add additional salt if desired, and perhaps another splash of vinegar. Remove from heat and transfer the caponata to a large, shallow serving platter or bowl and cool. Serving and storage: Caponata is best served the next day, so the ingredients and flavors have time to meld. Top with chopped flat leaf parsley or fresh mint. It also makes a nice topping for crostini: Pile it atop grilled bread that’s been brushed with olive oil before grilling, or let the bread cool and smear it with fresh ricotta or another spreadable cheese, then top with caponata. Fabrizia serves it with quartered hard-boiled eggs. This looks fantastic. I’m going to make it today instead of ratatouille! FYI: In Belgium they call anything mixed and mashed together “ratatouille.” Like mashed potatoes with endives (aka stoemp). 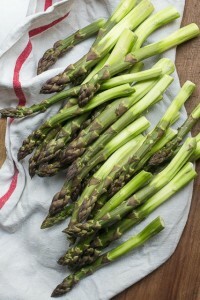 They also consider celery stalks to be inedible and eat only the leaves. Go figure. I also make my own tomato sauce and am about to start as tomatoes get really cheap now in the south of France. But it takes forever and no matter how much I make we eat it all before the winter is over. So we also buy sauce in jars. hmm I have lived in Belgium for nearly 12 years (as of tomorrow) and have often seen people eat celery (and grow it too) and only seen “traditional” ratatouille – (I have seen individuals eat canned ratatouille straight out of a can though eeew) – maybe there are regional differences in play? Could be. I’m thinking of Wallons. yes, those of us lucky enough to live in italy– use olive oil to fry too. you have to know where you oil comes from, so much commercial oil is faulty and you should not fry with it. Yes, it’s important to know where your olive oil comes from if you can. There’s so much information out there, it’s hard to sift through it all. But if you can get it from a producer or a reputable vendor, that’s the best option for sure. I’ve made Fabrizia’s caponata many times and it can’t be beat. (Especially since she avoids adding green peppers, which ruin many caponata recipes for me.) The hard-boiled eggs really complement it. I don’t like those either and green peppers tend to take over any dish that they’re in. So it’s nice that she doesn’t include them. I don’t know if they’re traditional in caponata either. If you are concerned that your eggplants might be bitter (if you’re shopping at a farmers’ market, I’m pretty sure the people at the stand can tell you more about the varieties that they are selling) – but you could salt them but sprinkling them with salt after cutting them up, and letting them drain in a colander for a half an hour or so, shaking the colander a few times to encourage the water to wick away. Some rinse the eggplant, then dry them well by squeezing them in paper towels or a kitchen towel, others simply squeeze them dry at this point. Either way, be sure to reduce the salt in the recipe to compensate for any saltiness the eggplant might retain. You can add more later. Love Ratatouille…the best was in Hawaii a long time ago. Since, I’ve never tasted or made anything that comes close it, sadly! Mom (Sicilian) never made caponata (? ), and I’ve never attempted it for same (and other) reasons…this is an interesting recipe; looks good! Maybe I’ll finally give camponata a go. I usually don’t deep fry at home either…the mess, so much oil! This seems more of a shallow fry. By the way, I just made your milk chocolate ice cream from The Perfect Scoop (minus cocoa nibs) for my granddaughters and it was a big hit with children and adults. 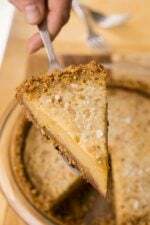 Thank you, David for another wonderful recipe and article. I checked out the Salsa Pronto recipe as well. It is I am thinking, delicious. She says in her instructions it could be canned. I was always taught that one cannot make additions to tomatoes when canning. Anyone have any thoughts about this? I made a caponata (not this recipe) some years ago and it was oily and no one at the party I hosted touched it. How do you avoid that? On the question of canned tomato sauce: I kind of compromise, especially in the winter when tomatoes are not good in New England. I buy Cento® Peele Tomatoes — They are San Marzano tomatoes and very good — and I mush them up in my hands if I want a coarse sauce or use a blender wand for a puree. I like this because it gives really good tomato flavor and I don’t have to deal with the added sugar and other flavors that commercial sauces so often use to “enhance” the flavor. 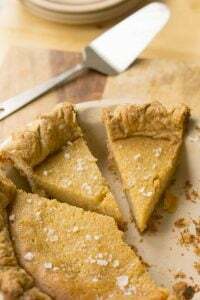 Great recipe that brought me back to my childhood. 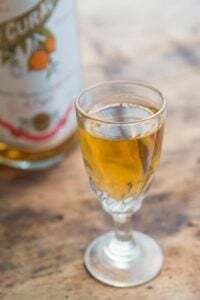 I always forget to make companata even though grandpa always made it along with his gardeniera! He made it with the raisins and pine nuts. Interesting too is that he used to put raisins and pine nuts into his meatballs as well. I agree David, worth the luxury! I love it too….a summer favorite here in NJ (a lot of Italian Americans live here). I add raisins and basil to mine. Most people do ratatouille wrong. The version in Mastering the Art of French Cooking has you fry courgettes and aubergines separately, then cook onions, peppers, and tomatoes before putting everything together for a brief simmer — similar to your caponata. It’s a lot of effort but it’s the only way to get a ratatouille where the ingredients taste of what they are. Oh, and yes it’s always better at room temperature the next day! The only way to do real ratatouille is separately. I learned to make ratatouille when I was living in France after college. That version was everything in the pot but carefully layered for the hardier veggies to get direct heat and the more tender on top to render their juices downward. That was good enough to fall in love with but I’ve made many, many ratatouilles since and I have to agree that cooking/roasting separately and then combining results in the best flavor and appearance. Have to agree with David too that second day is the way to go! …for almost anything with tomatoes: lasagna, panzanella, you name it. Fabrizia’s blog is fantastic! Like speaking with a kindred soul for me – thanks for the link David. Have a great holiday! This sounds great, can’t wait to try it. I usually make Julia Childs’ ratatouille a couple of times each summer. Each veggie keeps its’ own taste & crunch, but you’re in the kitchen all day! David, wouldn’t it work if I just toss the eggplant pieces in olive oil, spread it in a large pan and roast them? Hate to use so much oil. Yo are fabulous! love your recipes, blogs and cookbooks!! Thanks! Italians use olive oil not just for frying, but for it’s flavor, which is an important component of this dish. 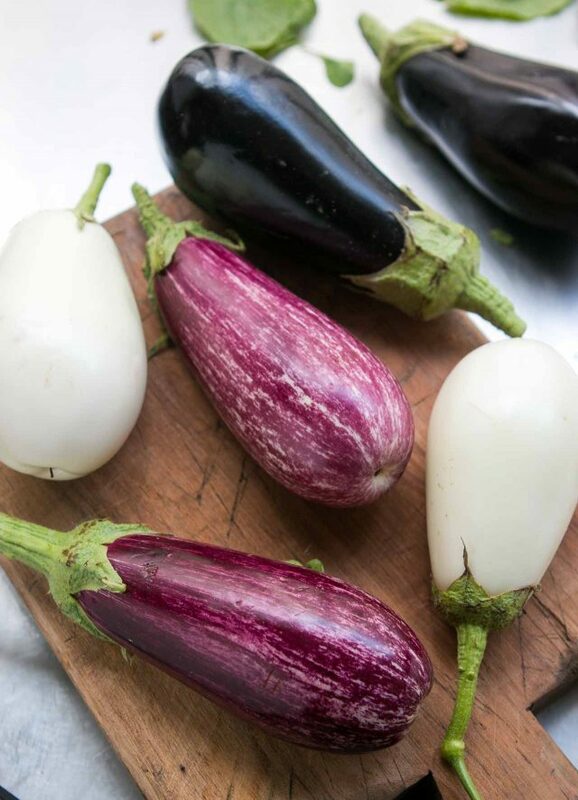 If you want to make a lighter version, you could prepare the eggplant the way you mention, but you might not be as happy with the flavor. Let us know how it works out if you do. 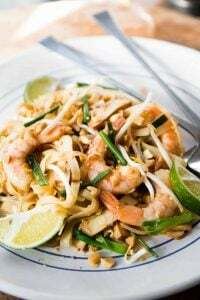 Dear David, I always love reading your blog and have enjoyed many of the recipes you share with us. But I am also often blown away by the beauty of your photos. What an eye! And I’m wondering how you get so much into the focal plane in your close ups. What settings do you use? What kind of cam rap and lens? David did a posting on his camera gear and the way he gets his pictures a while ago. Here’s the link, you should take a look. 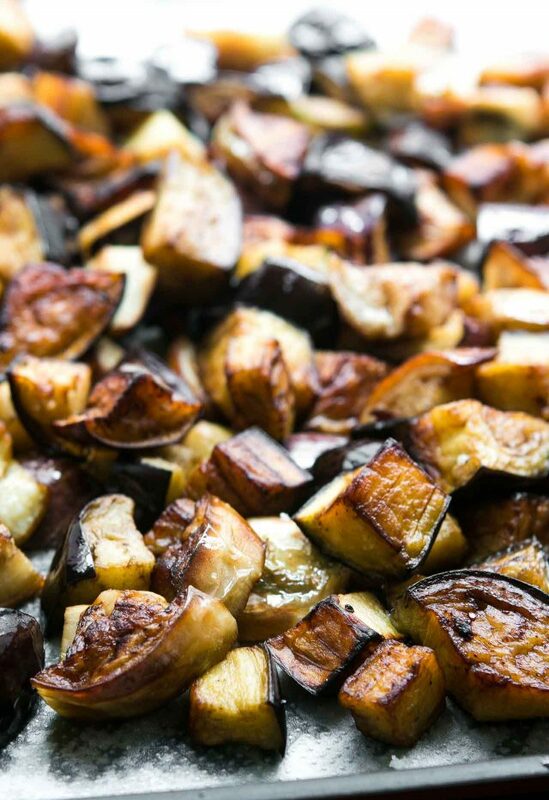 A great alternative to frying eggplant for the caponata is to grill them in the over. Once you’ve cutter them you put some EVOO on the pan, then the eggplant and then some more EVoo on top of them. The oven must be hot, about 250 celsius and in 20 minutes they are done. Be sure to add them to the “soffritto” just a minute after you add the sweet ‘n sour vinegar-sugar…great post David! There is ALWAYS so much to love in your work David. And also the comments are very often inspiring, interesting and some make me just nod and thinking ‘Yeah, I feel the same’. Yesterday, I had 4 American friends visiting and only during the morning I learned that one has a cheese intolerance and one is vegetarian. I immediately went for a quick ‘additional shopping’ trip and I came back with no aubergine but young zucchini & fresh mushrooms. I had some (of your hated) peppers, onions, garlic, huge bunches of flat parsley (which I got to know first in Italy), some tiny juicy tomatos and as I always ‘grill’ them all separately (in olive oil), I was kept quite busy. 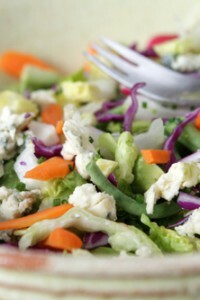 (I also created another 5 salads)…. I never ever salt my eggplants and over the meal I learned that in the States they have (had?) mostly aubergines in white and in small sizes, they really looked a bit like eggs and voilà, that was a mystery resolved! Demeter (your tomato sauce) are known for their impeccable quality and making, all their produce is organic too – I love them, although they are quite pricey. Also, I find that this year’s toms are very expensive… I still buy them though, can’t live without. Thank you for the spectacular photos too – such buzz, astonishing DoF & incredible colours. Merci mille fois. HI Kiki- if you look on the wikipedia entry you will see one of the varieties which looks like an egg. My neighbor grew several varieties, all of them were smallish and egg shaped but in a variety of colors. Caponata! I love it but totally forgot to make it this year. Thanks for your post, just in time for the last weeks of dining in the garden! The last few years I’ve started adding a square of very dark chocolate, as some Sicilians do. I like it even better that way. wow, interesting tip, thank you! Lovely! I can confirm that caponata definitely improves in the following days. My father was from Rome and my mum is from Malta but making caponata was as an important ritual as it is making tomato sauce in the idea of “Italianism”. We used to work together as in an assembly line and I’m quite sure I used to be the one chopping courgettes. THANK YOU THANK YOU THANK YOU FOR ADDING THE PRINT OPTION!!! I always cut and paste everything into a word document, so this is very much appreciated! Have a nice time off. Love your recipes and I find you quite funny too! To keep the oil light what I usually do is drizzle a little olive oil in the pan, throw the eggplant in to brown it up a bit then lower the heat, put the lid on the pan so it kind of steams the eggplant then I continue with the recipe. It comes out delicious and a lot lighter on the oil. My favorite book is the art of Sicilian cooking by Anna Muffoletto. So many recipes in there that my grandmother used to make. All recipes in her head of course! This looks amazing, David! I’ve heard a lot about Fabrizia from reading Luisa’s blog, so I am quite certain that it is. Thank you. Hope you enjoy your weeks off – you will be missed. Could one substitute peppers (which my husband and I love, especially red ones) for celery, which neither of us will eat when cooked and he won’t touch when raw, either? I love ratatouille, and I agree, the way to cook aubergine is to dice it and cook in a lidded pan with only a little oil – it will cook quite well. That’s not how I make Caponata but hey, that’s life. I have found though that blanching the celery is essential and rare to find in any Caponata recipe so kudos on that. I do recommend tasting it a lot to get that right sweet/sour agrodulce taste so necessary. It should be a little stronger than you like as it will calm down in a day or two. For me, putting parsley over it (yes, for a photo) is a big no-no as it doesn’t need it. Make it anyway. It’s great stuff and does last quite some time in home fridges. I love Fabrizia’s caponata recipe and made it with her in Sicily and later at my house in New Jersey. Sicilian celery is different – much smaller spears so I sometimes don’t use it in my caponata. 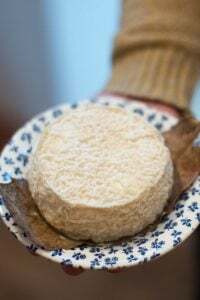 I totally agree with you, David, about the fresh sheep’s milk ricotta I helped make at a workshop with Fabrizia in Sicily – out of this world! I love both ratatouille & caponata, fabulous to have a new recipe. Even more grateful to be reading The Sweet Life in Paris again and for the first time in months actually wanting to cook! Thank you David, again!!! I’m with you; deep frying is always a recipe deal-breaker. Do you think it will be as good if I roast the eggplant? I was married to a Sicilian and the food there is fabulous. My fave thing was caponata, its just divine. But I love anything with aubergine in. When they ran out of their own bottled tomatoes,in winter, they just use tinned tomatoes. 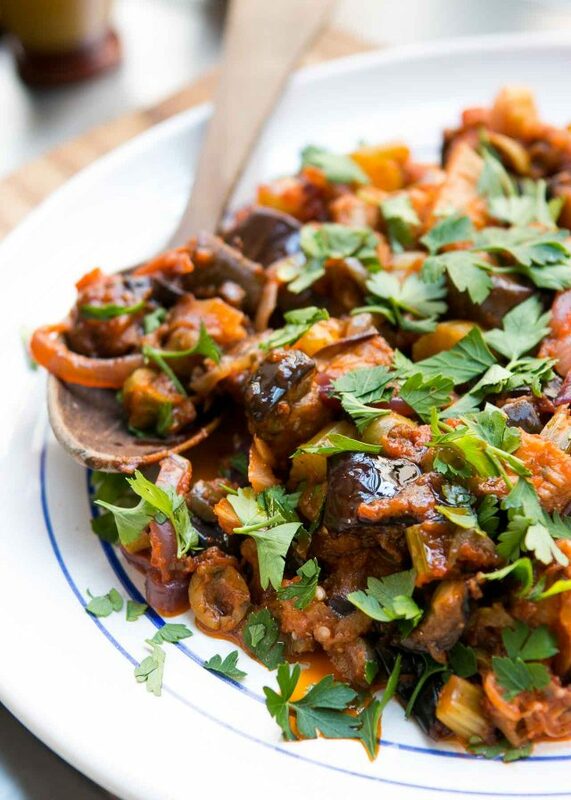 We love caponata in our house – it’s a staple. 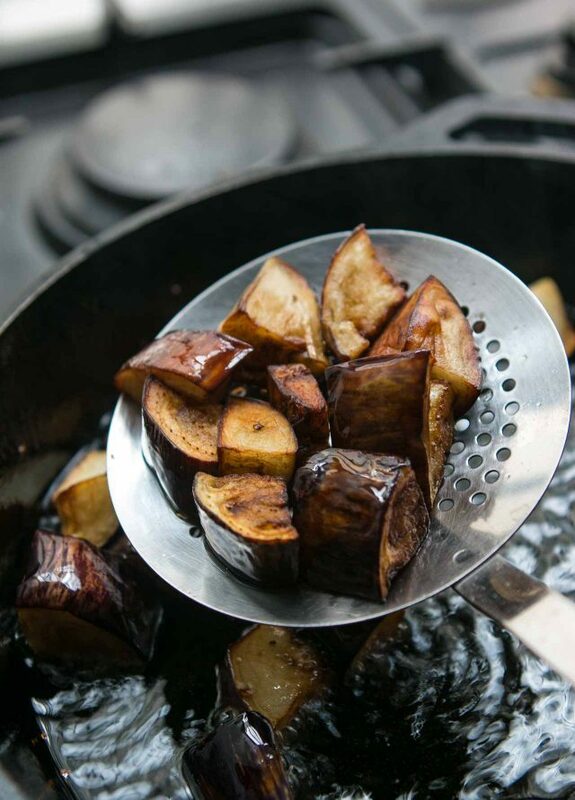 Quit frying the eggplant a few years ago, toss in olive oil and scatter on a cookie sheet and bake until golden outside and soft inside. We eat copious amounts as the pan comes out of the oven, so make extra. We also sub red peppers for green peppers because the flavor is softer. Rather than sugar or honey, we throw in raisins for sweetness. And pine nuts for texture. May you have a wonderful, quiet vacation! Thank you for your writing and recipes throughout the year – this one in particular. Great post. I love Caponata Siciliana. By pure coincidence I’ve just made a large caponata tonight. It is my own recipe that I prepare often in the summer but sometimes in the colder seasons as good vegetable are available in Italy all year around and good Sicilian tomatoes can be found in the winter. I don’t boil celery but fry it separately as I like it a bit crunchy. For long time I have used pine kernels (which incidentally are produced in Tuscany and Lazio and are fairly expensive, 6 Euros for 100 grams in the supermarket) but I have now switched to Sicilian almonds as they often do in Sicily. I keep caponata in the fridge for up to three days and it gets better and better! I love your idea to replace sugar with honey. I can’t wait to try. Thank you David. Enzo; may I ask about the almonds. Pine nuts are horribly expensive here too (Paris region) because they need an awful lot of hard labour before we can sprinkle them in our food and I’d love to substitute. Are you chopping them up as I do sometimes to add to something? Thanks for this idea. Looks delish! A propos of nothing much, have you tried fried capers? I’m quite taken with them since I had them at a party served over a whole smoked salmon. Then I served them on a caprese salad–excellent! Thank you for sharing your taste adventures, after reading your experience I feel as though I’ve been on a taste adventure too. I can’t wait to try this one – my eggplant here in Texas are bursting with beautiful purple treasure. Caponata !!! I discovered the recipe years ago in Paris and make it once or twice a year because it is a lot of work. This year I tried Laura Zavan’s recipe. Do you know her ? She is THE italian recipe expert in Paris. About salting aubergines, not only are they not bitter anymore but salt makes them soft, and I want my little cubes to stay a bit firm. What do you think David ? I agree wholeheartedly about not salting the aubergines. I forgot: Thank you so much, I for one shall be happy to have a print-option as of September – and thanks to your coding angel for doing that thankless job!!! I’m just so thankful to have found you one of these lucky days…. Ooh love the idea of this recipe especially since you like it but aren’t a fan of ratatouille (not a favorite of mine). 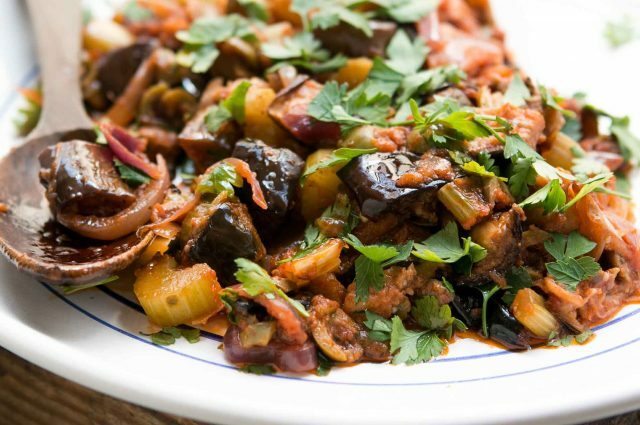 I have been looking for a good eggplant recipe to try on my 16 month old and this seems like the ticket especially as she loves olives and capers! Enjoy your vacation. Love the addition of capers and pine nuts will definitely add to my classic onion, red pepper, squash, tomato (fresh) plus tomato puree, and eggplant “g’vetch” as we call it here in Israel (NOT kvetch!). My tweaks – in the interest of keeping the oil down I don’t fry the eggplant but grill it on the stove top and stir it in once I have cooked up the ratatouille and let it simmer for a while. 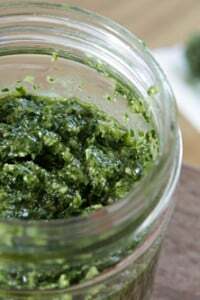 When serving I add a small dollop of quality olive oil from the bottle for fullness (much better when it isn’t heated), and a generous dollop of pesto …….. the mix tastes like heaven. If your palate craves some heat (like mine) a sprinkling of dried hot pepper flakes takes it to another plateau. Using a very generous amount of olive oil I brown the eggplant cubes under the broiler in my biggest lasagna pan, turning them twice. I use a timer! Almost hands-free, no spattering, no stovetop cleanup. Can’t wait to try this. But it leads me to my green olive conundrum…. Here in the US, what sort of olives should I buy? Picholines are too tiny to yield much pulp. Any recs? I used jarred, pitted green olives (without the pimento, although you could use them if you want). I think they call them Spanish olives or Manzanilla olives, in the U.S., which are carried in supermarkets. Also, Whole Foods has an amazing olive bar with several varieties of green, but agree, good jarred ones that are already pitted is the way to go. Ahh, caponata!!! Looks great, complimenti! I have my own caponata recipe (given to me by a friend in Turin) which is similar to yours, but with a yellow onion instead of red and a sprinkle of pine nuts and basil over the top. The honey is an interesting addition too! Lastly — I never salt the eggplant either!! Have a wonderful beach vacation…enjoy some good food and wine…and relax. You deserve it! I made this last night for dinner and it was delicious! Thank you for the recipe. 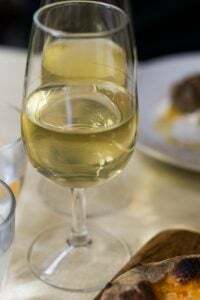 It also reminded us of our amazing trip to Sicily two years ago and so we had a glass of white wine with it too! C’est toujours un délice de te lire. Cœur et tripes. Looks DELICIOUS and I’m looking forward to trying it. I completely agree about good tomato sauce. There really are good ones that speed things up and sometimes it’s the difference between making something and just not so why be doctrinaire about it when a resource is easily available? Couldn’t disagree more about ratatouille though. Absolute food of the gods and a staple at my house thanks to the year round blessing of good canned or boxed San Marzanos. I love to make and eat Caponata too. Given the expense of pine nuts at the moment, you might try substituting lightly toasted pistachio nuts – they’re less than half the price in UK and they don’t make the dish seem any less Sicilian. Eggplant is my favorite and specially fried. Great recipe. I am going to try it. I do prefer to make my own sauce so it doesn’t upset my stomach. I think ratatouille is traditionally stewed Provençal vegetables, eggplant , tomatoes, pepper, onions, zucchini , herbs, cooked together for a short time to meld the flavours. Nothing complicated, but delicious. When you start cooking the vegetables separately you lose the whole point of the dish. It may be good , but not ratatouille. This recipes is an A+! I love eggplant and use it for cooking a lot. Great recipe. Super tasty! Thanks! I didn’t have the patience for it to cool, so had it with farro and a fried egg tonight. Tomorrow I’ll have it cooled. Fried the eggplant in about an inch of olive oil, but with the pan at a low enough heat it really didn’t splatter at all (maybe took longer). Then poured most out to save and fried the egg in the rest of the oil. I think if you removed the skin, the eggplant pieces may fall apart. (I’ve not seen any caponata recipes that use peeled eggplant.) It may be just your particular eggplant? Had dinner guests over last night and served this. All are foodies and 1 was a chef. Discussed this issue with them and , BTW, I salvaged it by pulling out all the eggplant and taking the skin off. All agreed, it needed to be peeled. It was devoured by all.Next time I will peel. Theu were in agreement that you are one fine chef! I had never made or had caponata before – it was terrific and a big hit with all tried it. I would agree about the peeling – the skin seemed a little tough. and will try oven roasting with generous olive oil next time. I also agree with one comment about the parsley – I forgot to add it the first day out. Added it the next day -think I may have preferred without. But, an absolutely brilliant recipe – so full of flavors and just wonderful on homemade seasoned toasts. Hi David, I am so happy to see you love Caponata! Unfortunately I am now allergic to eggplant, but I grew up eating them as my dad was Neapolitan & I also lived in Sicily as an adult for 3+years. My nonna made egg plant under olive oil, which I’d devour between 2 pieces of wood oven-cooked bread as well as Parmigiana & Pasta alla Norma. Now I cant eat eggplant, one of my favourite Sicilian veg salads, which many friends love, is Sweet & Sour Spiced Pumpkin (can use Butternut Squash too). If you don’t know it already, give me a shout & I’ll share my recipe. I used to feel the same way about ratatouille, then I made Julia Child’s. Each vegetable is cooked separately, and then they are layered,so the distinctive flavor of each ingredient is retained. Takes all morning to make, and totally worth it.